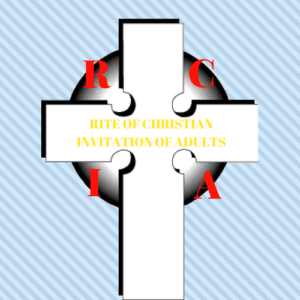 The process for entering the Catholic Church is known as the Rite of Christian Initiation of Adults (RCIA). Through study, prayer, and participation in the Mass, participants undergo a process of conversion where they study the Gospel, profess faith in Jesus Christ and the Catholic Church, and receive the sacraments of baptism, Holy Eucharist, and confirmation. If you are interested in becoming Catholic, want to learn more about the Catholic faith, or would like to sponsor someone on their journey to become Catholic, RCIA is for you. It doesn’t matter how much or how little faith formation you’ve had in your life. All are welcomed! A new program begins in late August and continues until 6 weeks after the following Easter. Those joining the Catholic faith are brought into the Church at the Easter Vigil Mass. Already baptized in the Catholic Faith? If you are an adult and have already been baptized in the Catholic faith, but have yet to receive the sacraments of Holy Eucharist and/or confirmation, please contact the Parish Office to find out how best to complete your initiation into the Catholic Church.